NEW YORK—Colin Goddard has never really left behind what happened to him at Virginia Tech. Shot four times during the single deadliest shooting massacre in U.S. history at his alma mater, Goddard has somehow managed to harness his pain for the greater good. Now he works as the Assistant Director of Federal Legislation for the Brady Campaign to Prevent Gun Violence, and is a passionate advocate for better gun control legislation. He added that Rep. Michael Grimm, Rep. Chris Gibson and other members of congress representing New York have “no excuse” not to back H.R. 1565. Twenty-one of New York State’s congressional representatives co-sponsored the legislation, Grimm and Gibson were among the six that refrained from supporting it. H.R. 1565, the King-Thompson Background Check Bill, amends the 2007 National Instant Criminal Background Check (NICS) Act to make sure all people who shouldn’t be able to buy a firearm are listed in the NICS System, and enhances the current background check process so criminals and the mentally ill cannot buy firearms. It also includes measures to protect Second Amendment rights. “Learning about our laws in this country alarmed me,” said Goddard, who says that his advocacy is a “way to bring some good” from what happened to him and other victims at Virginia Polytechnic Institute and State University. He noted with pride that every injured student went back to Virginia Tech after the shooting and graduated. These days, the hard part in his advocacy work isn’t getting up and speaking in front of crowds; it’s hearing about other acts of senseless violence. “It brings me right back to that day—I want to lock myself in a room,” said Goddard on his reaction when he hears about other shootings like Sandy Hook. In the end, he finds the strength to keep working to make things better. Several members of the New York state legislature were also present, including Sen. Daniel Squadron and Rep. Linda Rosenthal. New York State Attorney General Eric T. Schneiderman had a generally positive take on the gun control, although he pointed out there have been 5,000 shooting deaths since Sandy Hook. 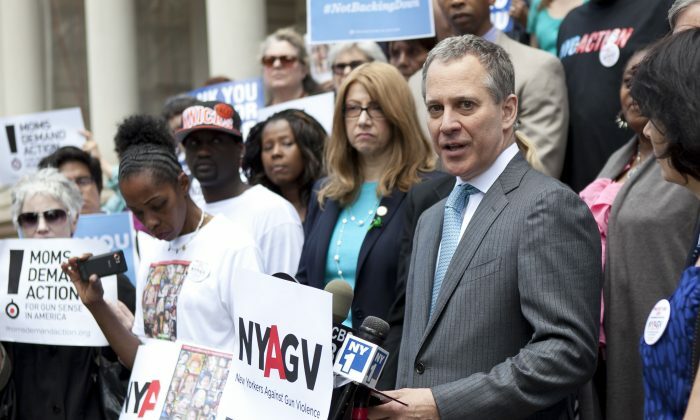 Schneiderman noted that despite legislation already in place in New York state is facing challenges, he believes the “New York model for 100 percent gun background checks” will eventually lead the rest of the nation to action. One of these legal measures, the NYSAFE Act, which was made state law in January 2013, is now facing at least six lawsuits. Schneiderman has no plans of backing down. The act prevents criminals and the dangerously mentally ill from buying a gun. It does so with a requirement for universal background checks when people try to buy guns. It also has tougher penalties for the use of illegal guns. Under NYSAFE Act, the murder of a first responder can land the killer in prison for life without parole. It also created the strongest assault weapons ban in the U.S.
“The fight to keep people safe from gun violence is a fundamental right to safety,” Schneiderman said.